In its design guidelines for the Touch Bar on new MacBook Pro models, Apple is urging developers to skip any non-interactive content, as well as avoid cutting off owners of other Macs. The Touch Bar shouldn't show "alerts, messages, scrolling content, static content, or anything else that commands the user's attention or distracts from their work on the main screen," according to the document. Developers are expected to treat it as an input device, rather than a second screen, and in fact the guidelines encourage matching buttons to the look of the physical keyboard, whenever possible. Functions shouldn't be possible solely with the Touch Bar, Apple adds. This is not just for backwards compatibility, but because people can choose to disable app controls in macOS. Some other recommendations include immediate responsiveness, and the ability to complete tasks in the Touch Bar if they're started there, unless there's no alternative. Apple is also nudging developers away from duplicating "well-known" keyboard shortcuts -- like copy, cut, paste, save, or quit -- or key-based navigation, such as Page Up or Page Down. Apple announced the redesigned MacBook Pro at a Thursday press event. While it's already on sale, currently orders will only ship in 4 to 5 weeks. Any chance they'll introduce a new keyboard with the Touch Bar for users of iMacs and older MacBooks? Preferably included in a wireless EXTENDED keyboard. Although, I would understand if the battery requirements would preclude that. Apple's USB kb sells for $50, their BT kb sells for $100. I suspect that the BT kb is not fast enough to be viable. Possibly, a new USB kb -- but probably would cost about $300. It would seem to make more sense to use a connected iPad instead of putting the Touch Bar on a standalone kb. The least-expensive current iPad is $270. Thus, you would add Touch Bar and mucho capability otro to the Mac, add mucho stand-alone capability to the iPad Pro -- and get long-lasting-battery, mobile computing at about half the cost of a new MBP! Devices using the new [twice as fast] BT 5 spec are supposed to begin to appear late 2016 - early 2017 -- about now. Using BT 5, it might be technically possible to implement a BT kb with a Touch Bar. But, at what cost? Don't know what the Touch Bar costs? Likely, you would need a new Mac (or a dongle) supporting BT 5. BT 5 maybe part of that tech. Apple is urging developers to skip any non-interactive content, as well as avoid cutting off owners of other Macs. Apple is also nudging developers away from duplicating "well-known" keyboard shortcuts -- like copy, cut, paste, save, or quit -- or key-based navigation, such as Page Up or Page Down. Well there's not much they can do to stop it outside of the App Store. I hope so. It is possible the touch ID and new T1 chip represent a technical challenge involving security. The desktop lineup is due for a refresh, so maybe we'll see this in the coming months. I'd like to see an extended keyboard that includes a touch bar as well as the entire right hand side of the keyboard being a touch surface that can accept pen input. Not sure how lefties would feel about that, however. The alternative would be no extended keyboard, but instead a OLED trackpad. iPad seems overkill in the sense that you really don't need half the stuff it contains. * requires porting some apps (Xcode, FCP, Logic, 3rd-party) to run, stand-alone, on the iPad Pro. The Touch Bar is 2170×60 pixels - a @2x Retina display, which makes an effective screen resolution of 1085 x 30. If the iPad is overkill -- IMO, the Touch Bar is underkill for most Pro Apps. This is really a contrived example -- there are only 5 layers (kinda' like tracks) most would have many more. And you can't do much with the Touch Bar only -- except scroll through the video. In the Keynote preso @54:23 they demo editing in FCP. It is nice that the Touch Bar changes content as you, select and drag a clip into the project, or select a clip for editing. The selecting and dragging is done with the mouse, not the Touch Bar. There are kb shortcuts and mouse actions to perform many more editing functions than are available in the Touch Bar. 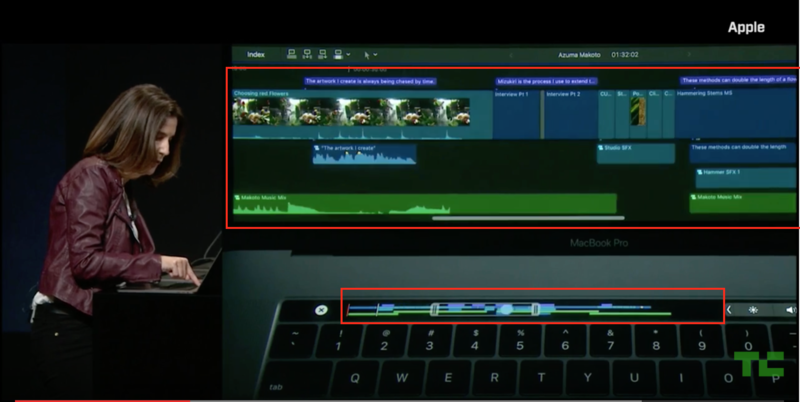 Changing colors and filters with the Touch Bar is pretty nice -- but, IMO, most editors will continue to to do most editing using the mouse and kb because of the precision they provide. I have a concern regarding usability for older applications that use existing shortcuts like option F2. Until that application is converted to use the new Touchbar is will be quite confusing and I suspect people will love to hate it at first and use older Bluetooth keyboards. Personally I would have rather converted the touch pad into a ipad like input device with pen capabilities. Artists would have loved that. I have a problem with the ports. Adapter world. Apple needs to release a hub that supports USB, ethernet, eSATA, HDMI from Thunderbolt 3. The Touch Bar is next to worthless to me, as I almost always use my MBP(r) with an external keyboard, often with the lid closed. Sometimes the MBP sits open on an mStand, but even then I can't imagine wanting to move my hands often to reach the Touch Bar. I also don't buy the argument made during the product intro. that the Touch Bar is so convenient because it's right where your hands are. IMHO it's much more disruptive to touch-typing and less accurate than using physical function keys; and for scrubbing the (huge!) trackpad can be used at least as easily with less reaching involved. The app Duet Display provides second monitor support and with the latest release (an in app annual purchase) allows an iPad to be used as a graphics tablet with Pencil support for iPad Pro. I've used Duet as my second portable display for my MBP since it first came out and it has performed well. I don't understand why Apple couldn't let developers see if the Touch Bar is there and active and allow them to create some custom, non-backward compatible interfaces that will only work under those circumstances. Let them eliminate certain interface elements from the main screen and put them on the Touch Bar only, but only when it's on a machine that has one and only when it's active. It's no different than adding interface elements for devices with larger screens or adding contextual menus when you 3D Touch on a newer iPhone. It's a new feature that should be able to add real value to the users who have it. Developers should probably give users the option to switch back and forth or choose their preferred layout.